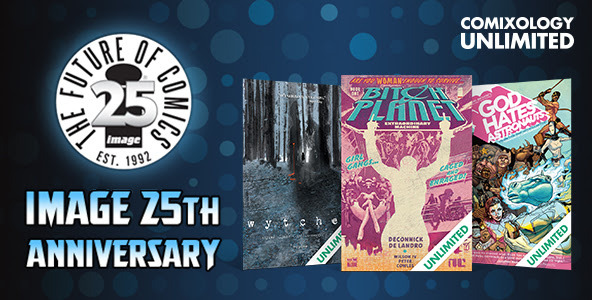 In celebration of Image Comics 25th Anniversary, comiXology, Amazon's premier digital comic shopping & reading platform, is adding 25 complete and ongoing Image Comics series to their subscription service, comiXology Unlimited. Beginning today comiXology will add titles every other week through May. ComiXology Unlimited is the best way to explore the amazing world of comics, graphic novels and manga for just $5.99 a month. ComiXology Unlimited is available on the comiXology app for Fire Tablet, Android, iOS and on the web at comixology.com. Start a free 30-day trial at comixology.com/unlimited. 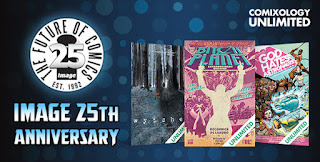 Fans should check back every other week through May to see what other complete series and substantial arcs of ongoing series from Image Comics are being added to comiXology Unlimited.